On Friday, the Senate passed a Congressional redistricting plan that disenfranchises minority voters. On that same day, the Governor vetoed a bill that would have helped assure a woman is paid as much as her male counterpart for doing the same job. And today, the Senate will take up some very bad bills blocking women’s right to choice and their access to health services. So in between, over the weekend, I tried to find a break from a few pretty tough days at your Texas legislature. I went to a couple of parades. One was the annual Juneteenth parade through Central and East Austin. 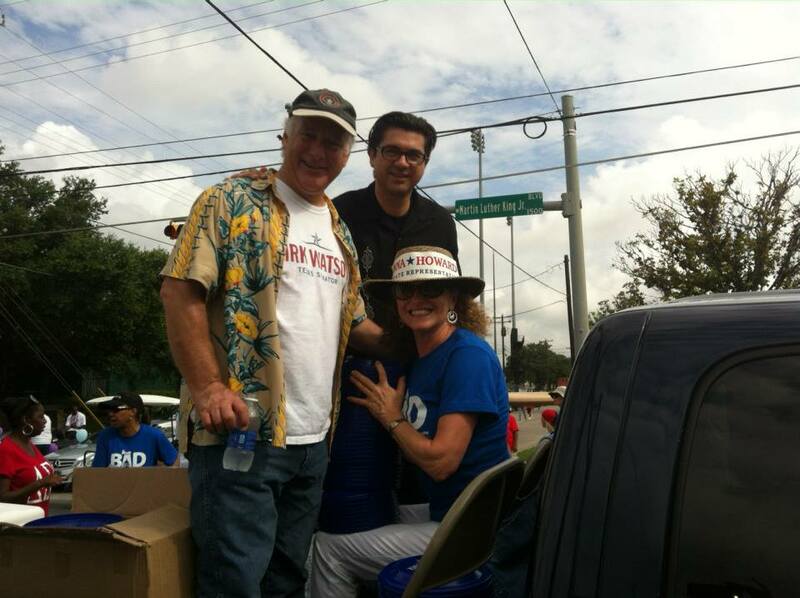 I rode in the Black Austin Democrats truck with Reps. Donna Howard and Eddie Rodriguez. It was a ton of fun. And no matter what Rep. Howard says on her Facebook page, I never came close to hitting her with a Kirk Watson frisbee. The other parade was a little … less formal. It was the annual Republic of Texas Biker Rally parade, which ran through East Austin and ended in downtown. I rode with motorcyclists from around the country on Friday night. It was a blast (and I’m not talking about the volume of the bikes). The rally even attracted some celebrities. 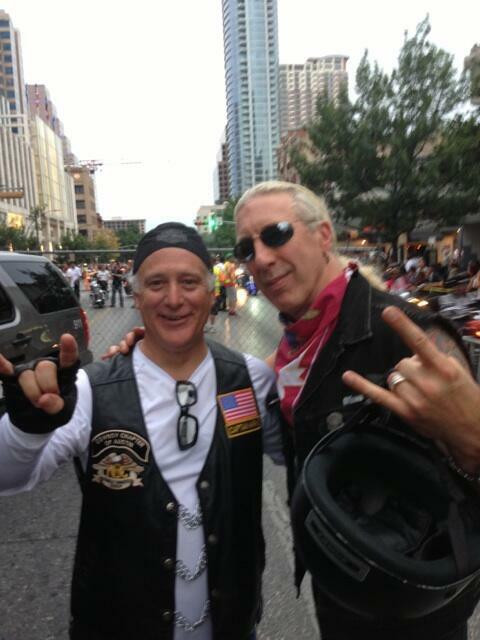 Here’s a picture of me with Dee Snider, lead singer of the ’80s band Twisted Sister. Twisted Sister, of course, brought us the hit “We’re Not Gonna Take It.” It’s timeless enough that Dee got into a kerfuffle (assuming it’s possible for heavy metal singers to get into kerfuffles) last year when Republican Vice Presidential nominee Paul Ryan used the song for campaign events. My new friend Dee thought that was wrong. Anyway, I’m not planning to play the song at campaign events or anything. I have enough going on in my life without being crosswise with Twisted Sister. Today, the Senate will consider bills designed to create a back-room process to negate women’s constitutional rights over their own bodies – and to make it considerably harder for women to access health services they need. As a package, the bills (among other things) would radically ratchet up regulations on clinics that provide these services. They’d also forbid women from terminating pregnancies after 20 weeks. These bills died in the regular session, as they should have. But now, those in control of the Capitol are resurrecting them through a loophole in Senate traditions and rules – one that the Lieutenant Governor has shown to be completely arbitrary – that allows bills to come to a vote with less support than was required just a month ago. You can – and should – click here to get a few quick facts about the bills that the Senate will take up today. Two years ago, the legislature slashed health care services for 147,000 women across the state and cut family planning by $73 million. The legislature eliminated critical providers from the Women’s Health Program, and the state is still scrambling to ensure that women have access to the basic health screenings, and breast and cervical cancer screenings, they need. This session, the legislature did virtually nothing to expand health coverage in Texas. It turned its back on billions of dollars in federal health care funding, even though we lead the nation in our percentage of uninsured. And it left 1.2 million children without health insurance for at least another two years. As I noted above, last week, the Governor vetoed a bill with what should have been an utterly uncontroversial premise: that women deserve as much pay as men when they do the same work as men, and they have the right to pursue that pay under state law when they’ve been discriminated against. In each of the last three sessions, I’ve filed bills that would be likely to reduce abortions by reducing the unplanned pregnancies that lead to them. My position is that the only sure way to assure an unwanted pregnancy isn’t terminated is to prevent the unwanted pregnancy. But my bills haven’t even been given a vote. This in a state that’s around the top in terms of teen pregnancies and repeat teen pregnancies. And today, the Senate is probably going to use a loophole in Senate tradition to shove through bills we’ve already blocked that would make it much harder for women to make decisions about their own health and their own bodies. These decisions come together in a way that seems specifically designed to ensnare Texas women. And why? For politics. To win primaries. To appeal to a tiny segment of this state’s voters, no matter the effects on millions of Texas women. These are political decisions that are part of a political war. Women are collateral damage in that war. The people waging it are building their political campaigns over the rights of Texas women. The American Congress of Obstetricians and Gynecologists, the doctors who are experts in providing women’s health services, oppose what’s going to happen today because the bills aren’t based on sound science or because they would let legislators prescribe how physicians should care for their patients. These bills would take away women’s health services without a thought to the issues that lead women to seek these services. Look, not one person I know likes abortion. Every single one of us who’s pro-choice wants to address this issue in a way that actually helps Texas women – like by reducing the number of unwanted pregnancies among teenagers. We’re willing to work to help solve these issues. But these bills don’t really offer solutions. Instead, they hurt Texas women. They’re a back-door effort to overturn something that’s been established law in this country for decades. Texas women will suffer for it. And I hope they hold folks accountable for it.